I was going to do something like "Marching into Success" or similar awful pun-based title but decided against it. To start us off... I mentioned earlier that I now (recently) have this habit of blowing tons of money on exercise clothes. I'm just too excited about getting fit, I guess. Some people pay for a gym membership or WW or Nutrisystem because it helps them commit... I spend $150 on new running shoes, compression tights, and bras. And just now I decided to round off my collection with a Nike+ widget, a slightly too-small jacket, and a performance shirt. The jacket should fit really well at goal -- it was on clearance and I couldn't resist. I really hope my PT clears my ankle for running tomorrow, because I am just dying to take the shoes out for a spin. I may go whether she does or not. Last edited by lackadaisy; 03-02-2011 at 01:16 PM. Lackadaisy: I haven't spent a penny on work out clothes for years. I still wear the same old rags I wore when I was in college: white Fruit of the Loom men's tee's (now gray and holey) a pair of short shorts bought in 2003, and a few pairs of old leggings that have have gotten so many holes in the crotch and have been re sown... their a mess! HOWEVER: this summer my husband bought me a really cute pair of running shoes (purple and lime green Nike's) because my old ones were so old it hurt to walk in them, let alone run. I am doing pretty good over here. I have had several really awesome days in a row and am pretty pleased with myself. I felt really crappy on thursday/friday/saturday but I think the bloat has gone down and I am looking and feeling better about myself. Hey guys! I want to join in this month. I'm forever stuck at 127 :-( so my goal this month is to lose just 3lbs... pushing into the closer-to-120-than-130 range, and to get better at running! GRRRRR I just got in the car to head to my 8am class... and the key wouldnt turn... this is the THIRD time in 2 years that something in the ignition has snapped. Thankfully this time the warranty is still good. Last time it happened 1 week after the 1-year warranty ran out and it cost me $400 to fix. EDIT: Meant this for another thread! Last edited by LLBoldAsLove87; 03-01-2011 at 09:23 AM. I am heavy right now but I don't want to dwell on it. I just want to push forward and think about my weight as a work in progress rather than "relosing." Focus is on healthy habits and reasonable eating. Also I have just discovered delicious zero calorie desserts that come in huge servings and satisfy my latent sweet tooth, so my life may have changed forever for the better. I had my first on-plan day since last Wednesday today and through my own scatterbrained idiocy totally forgot about a work party tonight - my reminder was my supervisor ringing me, oops! I hate work parties anyway so I was sort of relieved and spent my evening taking a hot bath, watching "300" and am just geeking out now listening to video game soundtracks and drinking tea. My biggest motivation this month is to weigh less than my mom when she gets here on the 18th. She's 5'6 and maintains around 128-130 and looks like a bag of bones - damn my tiny frame, I'll never look that thin - and I want this set of mother-daughter travel pictures to show two chicks happy with their weight (with the daughter ever so slightly slimmer...!). Can you beleive we are already in March of 2011?! Crazy! Ive been doing decent. Havent been as good as I liked. Sunday chowed down on sugar coated almonds and chips and dip. Oh it was just so hard to resist. I spent 4 days in a row (thurs-sun) off plan but I think I kept my cals around 2000 each day. So I am pretty sure I maintained. I ran 2.5 miles (25 minutes) for 3 of those days so I am hoping I didnt do any damage. Back on plan yesterday. I really want to be at 124 point anything on my 24th birthday! Its at the end of March. It sounds impossible considering I think I am only at 129.8. Thats 5 pounds in 4 weeks. It will be tough; but I am still going to try! Lackadaisy - My problem isnt with workout clothes; its just with clothes period!!! I cant go to the mall without buying something; ESPECIALLY when I am dieting because I always feel skinnier!! Happy March!!! My birthday monthhhhhhh woooooo!!!!! Krampus-- You can do it. You CAN take control. It will be fine. Focus on an hour+ of cardio a day and you can burn off anything you need to and be fine! maenad-- I'm in college now, so my justification is that I need to have bought this stuff at some point, right? Haha. It's a terrible justification. I should learn from you. Dianne, you definitely sound like you maintained well over the weekend. I have actually stopped shopping for clothes since losing -- I hate the way I look in most of the clothing styles I like, and I really want to slim down to a size 2 before I buy my work wardrobe for next year, so that's my motivation. Plus, I have great clothes from 4 years ago, before the freshman 15, that I'm determined to fit into again. But once I've reached goal... I better burn that credit card because I will be in SUCH trouble. Weighed in at 121.6 today. Might be dehydration, but I'm just super jazzed at being at my all-time low from last week again (which may have been from bad calibration, as it turns out) -- hoping I'll be under 121 by the end of the week! Last edited by lackadaisy; 03-01-2011 at 10:39 AM. February was a great month for me. I lost a few pounds, having broken a plateau. I had wedding pictures taken in December and I hated the way I looked in them. I cranked it up and lost 5 pound since then, and in my reception photos from this weekend I looked downright skinny! I lost two dress sizes. I am not throught feeling motivated, either, because my trip to Hawaii is a few weeks away. I want to get down to 122 before then. Krampus, I would like to know about those zero calorie desserts. I know how hard it is to break a sugar binge cycle. I was stuck in one for years. Woah, kwinkle, well done! It's awesome that you went down dress sizes. I refused to buy clothes over size 4, so I was just unable to wear a bunch of my favorite things for a while... I think I've gone down 1.5 dress sizes in about five weeks (the larger/vanity 4s now fit loosely), but I can't be sure. But clothes fitting better is absolutely the best motivation. Weight is just a number... skinny jeans don't lie. Congrats! Last edited by lackadaisy; 03-01-2011 at 04:16 PM. Well, I started March today weighing in at 138.8....just barely saying goodbye to 139, but at least I am back at 138 after seeing 139 for the last week. I hope to be at 135 by the 19th, but I am not entirely sure if it will happen...I seem to be going nowhere fast on my weightloss journey. Ahhh, CLOTHES! I forgot about those. I am so excited to see what size I'll wear in America. I hope I am at least a vanity 4. I really don't know. My perception of myself varies from "you're huge" to "you're petite." Down 2 lbs OVERNIGHT after one day on plan. Heck yes, we can do this. 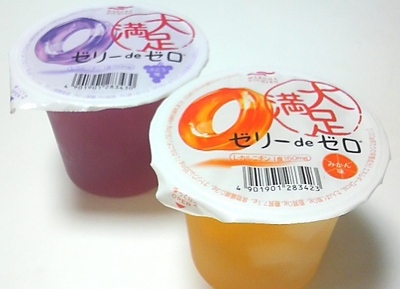 About the zero calorie desserts...they're sort of like Jello cups, but huge - 200g - and come in a variety of fruit flavors. With little cubes of mystery "fruit" in varying degrees of chewy/soft they are satisfying to eat. Last edited by krampus; 03-01-2011 at 08:15 PM. Krampus: Those look great! I'll have to go to the Japanese market here to see if I can find some! Disappointment sets in again. I feel like I can't commit, like something is missing this time around. This time last year I was on a roll and had lost 10 pounds by this time since the new year. Why on earth did I ever let myself gain the weight back in the first place? Husband had a friend over, they were hungry, snacks were made by me, then enjoyed by all. And I had a Vodka drink with some soda and water. could have been worse. krampus, We're about the same height (I'm a tiny bit shorter, I think) and at around 130 I was definitely a vanity 4, though a real 6: 36/28/37. I'm about 34.5/26/35.5 now, with extra pooch just under my waist measurement, or a real 4. I'm assuming your measurements would be somewhere between the two. Hopefully that helps. maenad, I know what you mean about it being harder the second time. The first time I tried to lose weight I was also depressed at the time, and I just starved myself and dropped twenty pounds in five by being miserable and gained it all back within a year. Were your habits sustainable last time around? Insomnia stinks and my thesis is driving me crazy, but two huge NSVs this evening: (1) I wore a size 4 high-waisted skirt I haven't been able to wear for months out today -- and at least above the skirt line, I looked good. Just have to work on that lower waist pooch now! (2) I mostly resisted snacks that were sitting right next to my feet for 2 hrs at a discussion group -- only had 1/2 cup of smartfoods popcorn and 2 (!) tiny pieces of Sour Patch candy. Then allowed myself a 230 cal rest-of-my-budget splurge on pound cake and strawberry syrup afterwards, because you've gotta live a little, right? Ended up right on my target of 25%/50%/25% f/c/p ration, 1250 calories. I'm determined to have a healthy relationship with food and I think I'm starting to get there. Last edited by lackadaisy; 03-01-2011 at 10:29 PM. lackadaisy I'm something stupid like 32-27-38. I have junk in my trunk for sure and rather muscular, thick legs. I always call myself "Chun Li" and my friends kind of agree. In dresses I can get away with much smaller sizes than pants. And in general all of me is fracking jiggly as heck. >_< I'm glad you're feeling good about your relationship with food and feeling confident about the way you look! maenad Commitment is HARD. The line between "committing" and "living a little" is fuzzy and it's easy to come up with all kinds of excuses for anything you can think of. There are free pies and bread out and guess who isn't eating them? Yay, new thread! Happy March everyone! lackadaisy WOW look at you go! 121! I'm so happy for you. Keep up the good work. Nice job on working towards a healthy relationship with food- that seems like they to long-term success. I definitely feel your pain on the thesis- my reports were due early this morning and the last 24 hours have been crazy. It's hard to stick to a good eating/exercise routine during stressful times like these (especially when writing and researching- it's such an open-ended schedule that it's easy to stay up munching and writing till late in the night). I just hope you are able to catch some zzz's soon! kwinkle good for you for committing and losing 5 lbs! It definitely seems like you can lose 2 lbs before your trip. What's the occasion for the Hawaii adventure? I'm super jealous. LLBold so sorry about your car. 3 lbs this month sounds like a great goal. That's about what I'm working towards too. Dianne great goals for March too- happy early birthday! Do you have any big plans for your 24th? Wildflower- your goals look great too. I should probably sit down set out some hopes for March as well... it's a good idea to have something to work towards. krampus Haha I remember buying XL shirts when I lived in Southeast Asia and not being able to fit ANY pants, so I know how much you're looking forward to American sizes again. I'm the opposite right now- Indian clothes are super loose and large so as to show modesty. I can easily fit into an XS here. Talk about vanity sizing! Oh man guys, good day for me too from here. Weighed in at 129.6 this morning, down .2. Finished my reports (!!!!!!!!!!!!!) and submitted them at 10:45 AM my time/12:15 AM New York City (where they were due) time, so only 15 minutes late. For consultants that is pretty much like finishing them 2 weeks early . I had been staring schlumped over at a computer screen for the past 24 hours straight basically so as soon as I emailed them I ran down to the podunk gym in our apartment complex for a good workout. I didn't even need music or reading material, just doing something that didn't require any mental energy was such a stress reliever. 30 minutes of cardio and 15 of weights. I was up for more but I have a strange pain in my right hamstring/groin so I cut it a little short. Now eating homemade daal (Indian-style lentils) like it's my job. Nails may get done later today. Life is good.